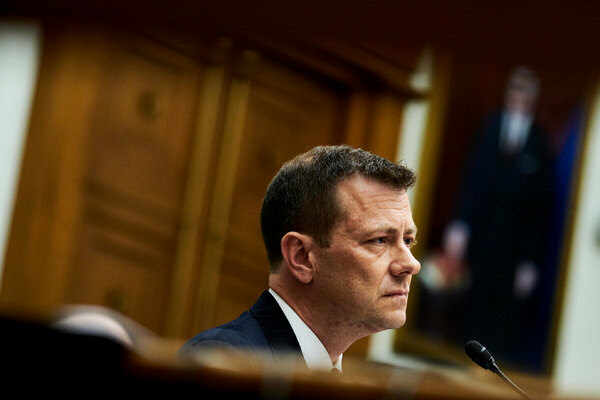 WASHINGTON — Peter Strzok, the F.B.I. senior counterintelligence agent who disparaged President Trump in inflammatory text messages and helped oversee the Hillary Clinton email and Russia investigations, was fired for violating bureau policies, Mr. Strzok’s lawyer said Monday. Let's see if the State can turn him against Brennan, Clapper, Ohr, etc. I hope that happens too! At the risk of once again ‘harshing Robin’s mellow,’ I doubt they will! Why this traitor has not been arrested for interfering in election is mind boggling?? Anyone else would already be serving time.Next time I am on jury duty they will be innocentu til we start 5o be justice back to our country. No more guilty verdict for little guy until these traitors are facing justice. I could not agree more with you! He should have already been tried and convicted and sitting in prison for the rest of his life. I actually did the happy dance when I saw this! Now, here is for the "You can't make this crap up" file! Strzok’s team created a GoFundMe page with a lengthy statement to raise money for his “legal costs and lost income” and said on the site that his firing was “apparently driven by political pressure.” The site had raised more than $51,000by late Monday evening. Peter Strzok has a net worth of $1.4mil. His wife makes $230,000/yr working for the SEC. But, a GOFUNDME Page has been set up for him! Just like our old pal McCabe! These guys are unbelievable! There is a sucker born every minute. Just look innocent and you might attract some. What took them so long? Right? Right?